Brace yourself for another 10 mile long blog post; much like the recent one on the Harvard Future of Learning site, this one focusses on another syndication driven wordpress site. Brian Lamb approached me in mid June about working on this project, and coming on the heels of the Harvard one, I was able to leverage bits of that site’s framework– but it is still nowhere near a copy/paste/go operation. These sites are hand crafted. 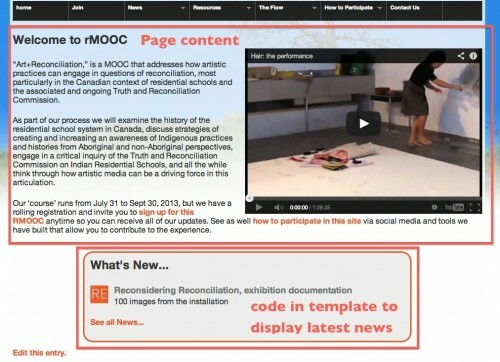 Art+Reconciliation addresses current issues in Canada dealing with the history of residential schools and the ongoing work of the Truth and Reconciliation Commission. 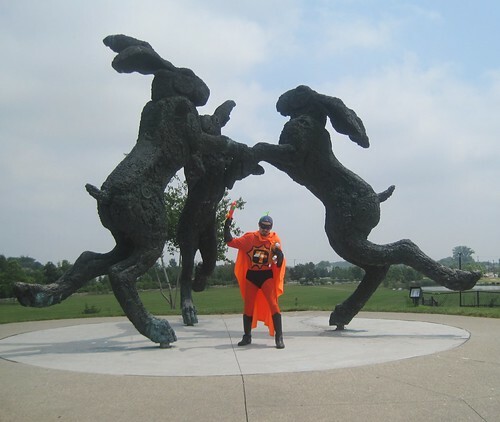 The idea is (I might be wrongly paraphrasing) to examine how art and artists can both create awareness of the issues and help generate communication around the issue. 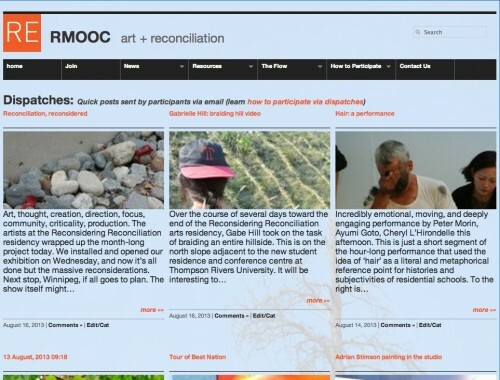 As conceived by Ashok Mathur, this would be an open experience where online participants could be part of the August activities at TRU, where artists were invited for a residential experience in Kamloops, and leading up to a national TRC gathering in Vancouver. A driving part of the design was an effort to forefront the media that would be part of the activities, as well as infuse the syndication of content from twitter, flickr, blogs, etc. 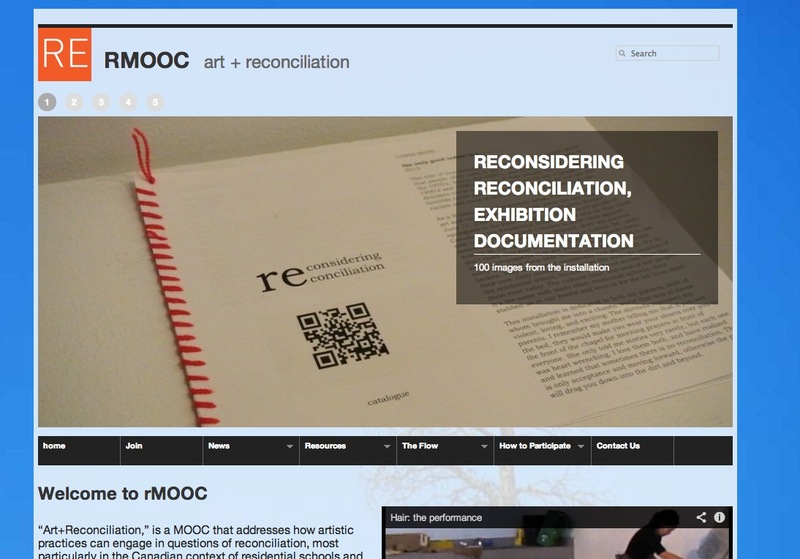 The “MOOC” part of rmooc is open to question- it was not a course per se, but a series of events and performances. It’s not massive, bit was open and parts were online. Who cares, the media shows some amazing gatherings and art making. 72 News Items content written or categorized by Ashok. 47 resources written or categorized by Ashok. 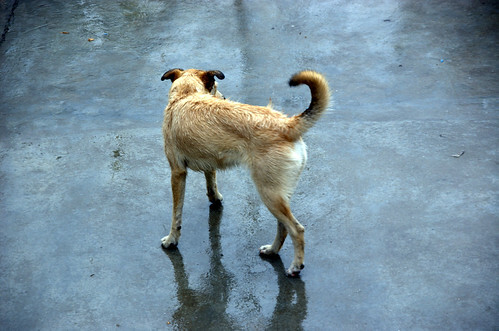 49 items spotlighted as categorized by Ashok. So if you just look at numbers, you would say “obviously not massive” but numbers are not the whole story, and the goal of the first phase of rmooc was in the events that took place in Kamloops. And again, rmooc is only halfway through its course. As before, I will attempt to review the design elements, the WordPress customizations, and the setup and implementation of the syndication parts. 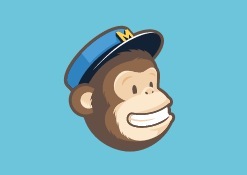 An additional (and new for me) element was using Mailchimp for managing email communications. Much of what follows paralleled the work I did previously on Harvard’s Future of Learning Institute site. As a start, I provided a few themes I found that had potential for a media-rich site. A few were from Elegant Themes, partly because I have an account and access to their entire collection, but also some from Graph Paper Press— a favorite since the days I created the MIDEA site and my own Barking Dog Studios photo site. Now I have a few thoughts about themes- they have come a long way from some of the first ones I started bending to my will back in 2008. They have gotten a lot more complex, with full admin systems for customizing, a lot of jquery add-ons… and just a lot more to wrangle then in the old days when you had to fiddle with maybe index.php, single.php, style.css. But Ashok liked the Gleam theme (and I did too, before I used it)- it has a portfolio look, and had templates for full screen media. I spent about 2 days on it (the week before things were supposed to launch), and found myself frustrated with the limited menus (no submenus) and the weird artifacts of all content being loaded through some funky AJAX calls to the main display are. Embedding tweets was impossible (the ajax loader was somehow eating the twitter library), and some templates kept putting blog like content below pages. I made a recommendation to switch out the theme– in WordPress theory, you can do that at any time, but once you start customizing for syndication content, theme changes call for a modicum of code changes. The sooner you can nail the theme the better. I decided to go to the free Graph Paper Press F8-Lite theme (58 items at 1.9Mb). I liked the big feature slideshow header and the icon driven layout. When I started work on it, I ran into some vexing problem that was happening trying to child theme it– and I said, the heck with it, I will just monkey with the raw theme file. Changing the theme meta data should keep someone from accidentally updating it. My hunch is the updating themes is hardly critical. Hence my old dated theme. Have not updated in like 6 years, and it still works. You can find my version of this theme on github. Without this, your post thumbnails will be distorted in this theme, since they are non-square. Like the FOL site, the front of the site is set in WordPress to be a static page (the “About Page”), with extra code added to the front-page.php template (this is useful as it will be used not matter what the setting is for what is put on the front page). The top part is the content of the page, which Ashok was easily able to change the content on a regular basis (e.g. insert a new video), while the bottom is coded to show the title, excertt, and link to the most recent item in the News category… so as new news items get added, the front page changes. The normal “bloggy” stuff is then set to go to a “page” for the site “flow” my nickname for “all the stuff”. There was a bit more fiddling I had to do to manage the length of the excerpt displayed on that slideshow; syndicated content did not arrive with a defined excerpt, so I had to code it in manually (line 36 in slideshpw.php) and strip out HTML. One of the things you face when using a graphic oriented theme is that they often rely on thumbnail images for the archive listing– and often your syndicated content comes in without any images. I’ve not seen many themes that let you define a default image, so you need to rummage around in the code to find it. Yes, this is shamefully hardcoded into the theme. Sue me. Ugh, I am getting way to deep in the technical. Also, for all syndicated content, note the addition of a link only logged in editors/admins will see to “Edit/Cat[egorize]”– on the site, the link will go tot he source, not to the local synidcated copy to edit, so if we want to add a syndicated item to our Spotlighted content, all Ashok had to do was to edit the post and check the Spotlight category. The left column is just the titles/links to the most recent posts on the site, the middle column is the one that twitter provides (in an HTML widget), and the right has a logo, the search widget, and a flickr one provided by the Awesome Flickr Gallery plugin. The left side bothered me a bit, because again, a post that was a syndicated tweet ended up with a long, title. Luckily I found in StackExchange a method to change the behavior of this widget to have it truncate long posts. It’s a bit long but you can find it in functions.php. I did bits of stylesheet fiddling to change header sizes, colors, etc. Always visual tweaks to do. Limit Login used to fight the brute force login attacks that WordPress seems to be attracting. Links Shortcode added to a page can list all of the items in a link category. 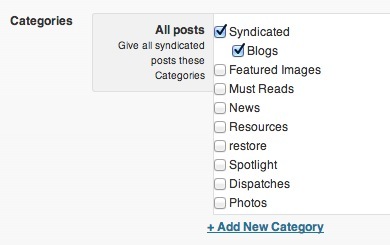 I use it to show the Subscribed blogs – Since Feed WordPress stores these as links, I can display all of the blogs. Because there is an option to exclude links, I am able to prevent the links for feeds from flickr, instagram, twitter, etc to be shown. 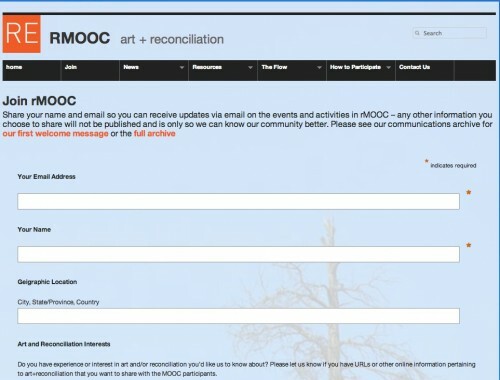 An important part of this project was a regular series of email communications to people who would sign up to receive them, important as RMOOC is address issues of interest to people across Canada, and attracted others from the US. Our early stage effort to collect this was an old fashioned Google Form. I could sense that it was not optimal for Ashoik, since each mailing he would have to go to the form, copy the recipeients email, and compose a plain email message. 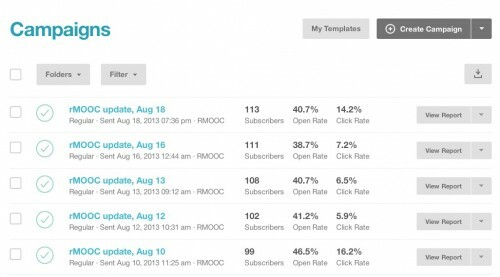 This was a good time to explore using Mailchimp for communications for several reasons- allowing people to opt out in one click, to use better templates for sending messages, and for getting some data on responses. And frankly, the messages look more professional. And you get an archive. And, for less than 2000 messages a month, it was free. I set up an account, created a demo template, made the first email list, and then created an account so Ashok could send out the messages. As we were starting, I tried using the method where it can sync to a google spreadsheet, since people were already using that, but it meant for each mailing, the list had to be manually synced (or I missed how to make this automated). I frankly saw no reason to keep using google, and just switched the form to a Mailchimp one (and we could keep the other fields we asked for, location, and questions). I have to say, once set up, Ashok went to town with using the composition features to send out some great update messages (see the archive, again managed by the chimp). I’m pleased with how well it worked, and this gave me the little nudge I needed to see how Mailchimp works. This is of course, the magic bus, the tools that bring content/media form external sites into rmooc using Feed WordPress, the plugin that lets us put RSS feeds into it, and like a bus running 24/7 it goes about bring copies of related content into our site. One key for Feedworpress is setting up the defaults that are applied for every feed. Thats a nifty part of the design, because for specific feeds as needed, you can override, but your work is easier if you get these defaults set first. 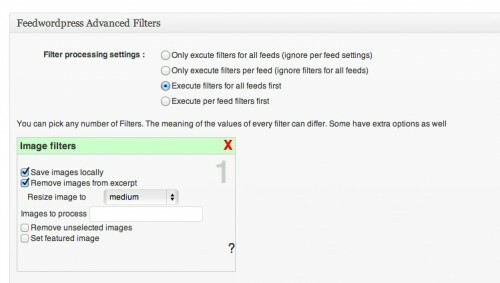 If we later have a feed where we want to syndicate everything, we can simply turn off this filter per feed. This may seem odd, but we are not adding real users to the site. but this means that a created author (in this case the feed source) could be used to display all posts syndicated from that blog. 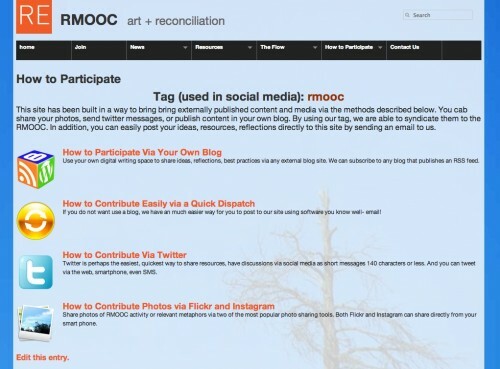 This was not put to use on rmooc, but could be implemented later, especially if the blog component gets used more. 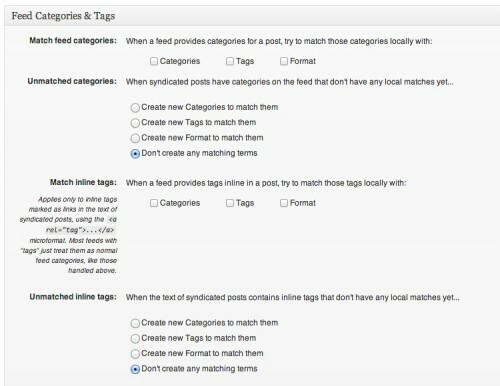 For Categories and Tags we ar enot using, so there is no need to bring them into syndicated content. While we hope one day to set up ways to make this more streamlined, for this site where the blog number was small (and not readily used yet), I opted to used a Google Form embedded into a site page to get blog URLs. I set the spreadsheet to notify me when new submissions are received, but yes, it becomes a manual cut and paste to add a feed to the engine. The only blogs we had now were ones set up to test syndication and a few from topic related sites this was a really small number (3) of blogs in the mix – for the two informational sites, which would not be adding RMOOC tags, we just would bring in all their posts because they are relevant. This makes it so anyone with this address can post to the site by sending an email! The subject becomes the post title, the formatted email the body of the message, and any attachments get uploaded (well the ones that WordPress allows as an upload). Now one hitch is that when these arrive, they are not assigned to a WordPress category, so to be able to organize them by category, my semi-brilliant idea was to make the Dispatch category the default category, meaning that creating other content means you need to a category when composing a post. That seems to work fine. The benefit of the Dispatch is that participants can easily add to the site w/o having to make them use the WordPress interface (does anyone remember this cool site called “Posterous”?). Everyone knows how to use their email, right? And it also means people can post from their mobile device. One thing to keep in mind is that all posts that come in this way get attributed to my WordPress account, since I authorized the JetPack plugin. This is not a problem on this site, since I removed the display of author’s names on posts. Dispatches than are anonymous. 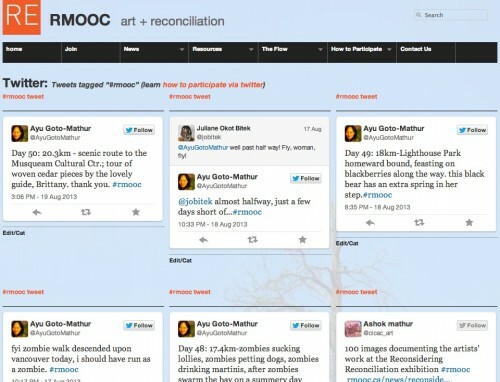 We saw good use of the #rmooc hash tag as seen on the activity we were able to bring into the site. Now there was a huge wrinkle- When Twitter flushed their 1.0 API, they flushed as well public RSS Feeds. This seemed kind of duct tape technology, but has worked solidly. 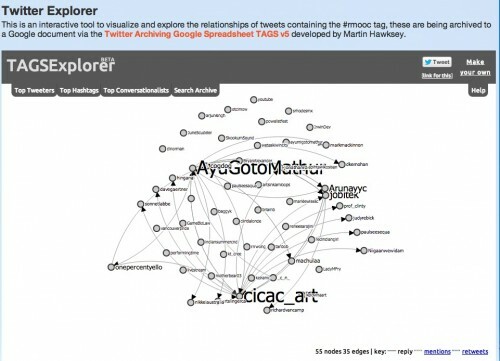 For every project that uses a twitter hash tag I use Twitter Archiving Google Spreadsheet TAGS v5 developed by Martin Hawksey. 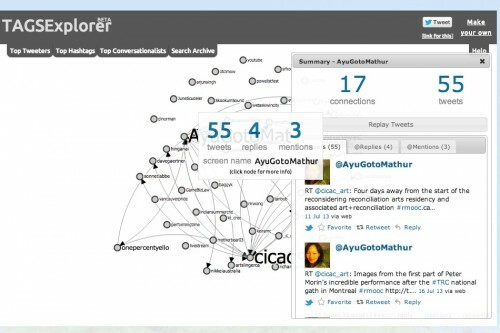 This not only creates an archive of all tweets, we get a summary of activity, a neat visualization, and a searchable archive. I embedded all of these in the site with iframe tags- these are great analytics to provide your project. You’d be crazy not to use them. I found out almost by accident that Instagram has RSS feeds, and it is clean to see how it works — http://instagram.com/tags/rmooc/feed/recent.rss so I combined in the photo content from these 2 photosharing sites (although participants so far have not used Instagram, it is there if they choose to do so). 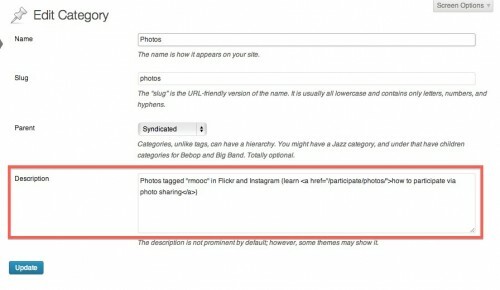 I have to say that photos tagged in Instagram showed up within a minute in its RSS feed- flickr has always been inconsistent, and sometimes it takes more than 24 hours for a participant’s photos to show up in the feed for a flickr tag. Even worse, we went through all kinds of crazy stunts because no matter what Ashok did to his account, his photos never turned up. For a while, he was using an email to flickr address I have on a test flickr account, but later he found an older flickr account that worked as it should. Flick can be a big box of mystery, but that us another blog post. Probably a lot. If you can turn this process into a button push, you are the better designer/coder than I. But we are not even done, and I am very grateful that Ashok has been patient through things like the Hippie Hosting hardware failure… and I will barely mention the weird hacking that cut out a few days of content (thanks to Tim we got a backup) and was able to do a few other bits of gymnastics to restore. Let’s say, if you see unusual user accounts start to appear on your site (besides the ones Feedwordpress creates), delete them. Somehow, two subscriber accounts got added, and at some point they were able to delete all media and all pages from the site (and change all the admin passwords). I have no idea how this happened. One thing that helped was I set up a development site to do the first bits of work, and is a place I used to try out code changes rather then dinking on the live site. The Hippie Hosting Installtron tool is great because it can clone a WordPress site to a new URL/domain. I am very grateful to Brian and Ashok for bringing me on to do this site; as with all of them, I end up coming away with a few more crazy wrenches and pliers for my wordpress toolbox. There is growing interest in these kinds of sites, and maybe more when the DOCC as anto-MOOC fever takes off. 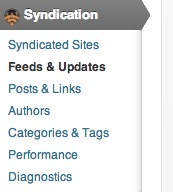 Below you will find examples of the syndication sites I have worked on plus links to these development notes. Of course this is all based on what I learned fiddling with the ds106 site… you can find all post related to these projects at http://cogdogblog.com/tag/building106. how is the project addressing ‘backlash’ especially in the highschools and ‘white’ communities, near ‘ Indian Reservations’?